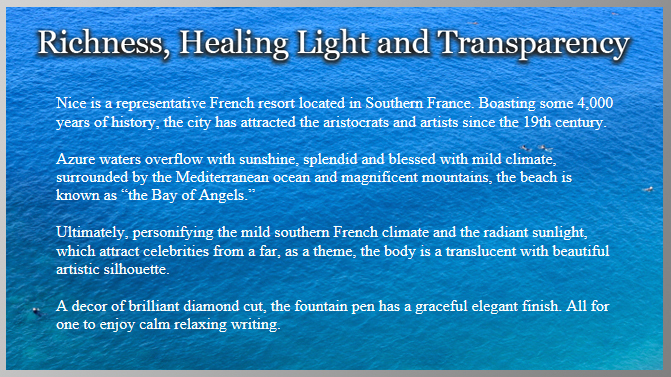 The second in the South Of France series, The Nice Pur, is an extraordinary example of the style, craftsmanship and advanced ingenuity of Platinum Pens. 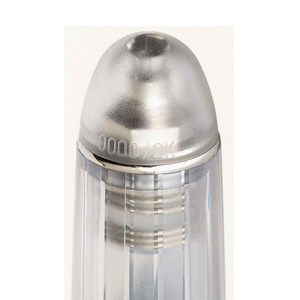 The Pur has the slip and seal cap mechanism to prevent ink loss due to evaporation. The newly redesigned nib in 14kt gold with rhodium plating allows for a smooth and consistent pen stroke for a truly memorable writing experience. The splendid diamond cut finish of the transparent risen body invokes the essence of the shimmering waters along the shores of this unforgettable city. 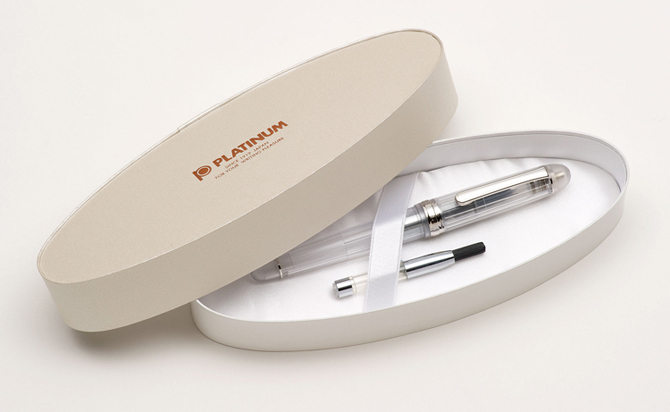 *Only the first 2000 pens in production will have the serial number laser engraved on the cap. Ink drying out due to moisture evaporation. Problems with dried ink if the pen is not used for three to six months. It can be necessary to clean the pen using our Ink Cleaner Kit or even to repair or replace the nib itself if the damage due to dried ink is too severe. At the request of customers, we at Platinum Pen Company have gone back to the basics to deal with this problem. This is the first fountain pen which has our unique “Slip & Seal” structure in a pen with a screw-type cap. Thanks to this innovation, currently being patented, it is possible to have a screw-type cap with complete air-tightness. *It applies “Slip & Seal Mechanism” that prevents dye or pigment ink from drying out in the pen, therefore even after two years of not using the pen with the cap on, it provides smooth reliable writing. 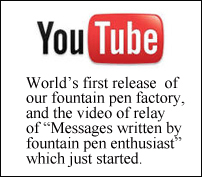 This mechanism allows those who only use the pen once or twice a year writing with fresh new ink. A process to make asperities on the surface by striking sand grains. Depending on the size of the sands, shapes and strength of striking, the degree of opacity changes. It is similar to cutting grooves with a chisel and the angle of the cut changes the shimmer of the light. Packaged designed exclusively for the Pur. When purchasing the Nice Pur from our authorized dealers, the packaging will include, a cartridge converter,ink cartridge and the manufactures warranty card.